I don’t have a favourite photograph but I appreciate the photograph collection of my parents-in-law. I can remember sitting down with my father-in-law Peter Young (1920-1988) and asking him who was who in his collection of photographs. I noted down his answers in pencil on the back of each photo. Because we had that conversation, I have been able to work out the identity of many of those pictured. But despite these annotations there are still many puzzles. stamped “3 73” on the back, Peter identified this as perhaps Uncle Fred and Maggie. Uncle Fred could have been Fredrick Beswick Cross (1893-1959), brother of Elizabeth, father of Ethel and Freda Cross who might be the two small girls pictured picnicking. But it could also be Frederick Fletcher (1890-1967) who married Margaret Cross (1897-1926), Elizabeth’s sister and Peter’s aunt. A picnic near the Ballarat Botanical Gardens about 1924. Elizabeth young nee Cross (1900-1949) is wearing a striped dress. Her son Peter is the small boy seated wearing a tie. The older woman in a black dress is probably Anne Jane Cross nee Plowright (1862-1930), Elizabeth’s mother. 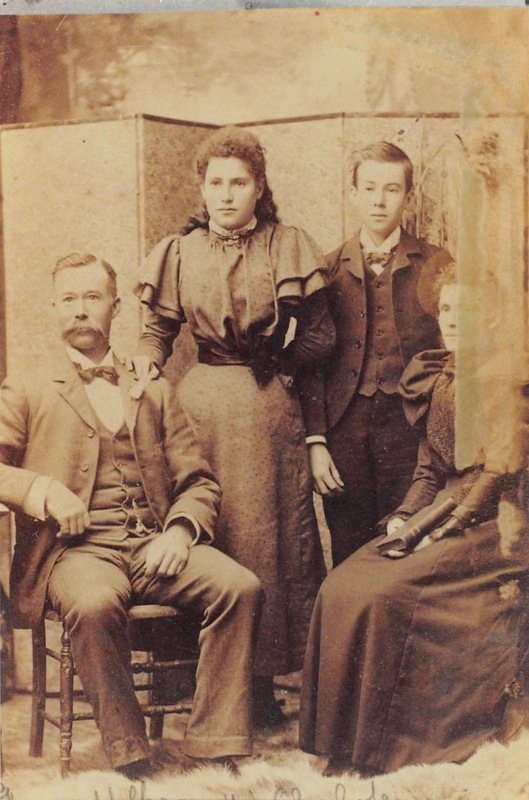 I suspect the man in the hat might be Frederick James Cross (1857-1929), Elizabeth’s father but I am not sure. The two little girls might be Ethel and Freda Cross, born 1919 and 1920, Peter’s cousins and about the same age. I am not sure about the other two women, though the woman sitting by the tree is most likely one of Elizabeth’s sisters. 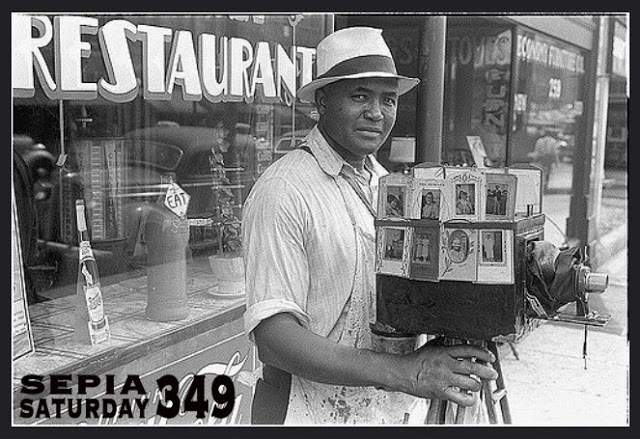 The last three photographs were all developed from the same roll of film based on the stamp of “3 73” on the back. I assume they were taken on the same day. 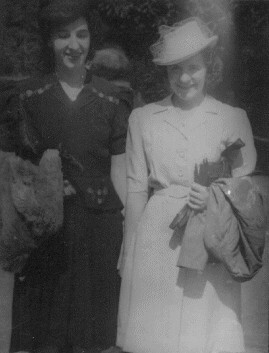 Perhaps some cousins also have photographs taken on that day and can better identify those pictured. The locations of these photographs are still recognisable. Children still sit on the lion and have their photos taken when visiting the Ballarat Botanical Gardens. In the early 1990s, when I started our family history research, we met Noel Tunks (1943-2008), a cousin by marriage, the 2nd great-nephew of the husband of the 2nd great-aunt of my husband. Noel was very generous in sharing Tunks family photographs. Some were of members of the Young family. I am still puzzled by two of these photographs. I have slightly different conclusions now than I did more than 20 years ago but I am still not convinced I have the answers. The notes I have on the back of the photo, made about the time it was given to me by Noel Tunks, read: photographer Charlie Farr Maryborough (no 15198 (?) handwritten on back). Jack Young inscribed on back. My own notes say “looks like George Wilkins with Ethel and George (son) & Jack & Cecil Young“. Cecil was born in July 1898. His brother John Percy, known as Jack, was born in August 1896. From the inscription on the back of the original I am fairly confident that the two young children are Cecil and his brother Jack and, looking at the age of the two small children, the photograph was taken about 1899. According to the Victorian genealogist Susie Zada, quoting Australians behind the Camera, the photographer Charlie Farr worked in Marybough from 1893-1906. So my guess that the photograph was taken in 1899 matches the photographer’s business dates. 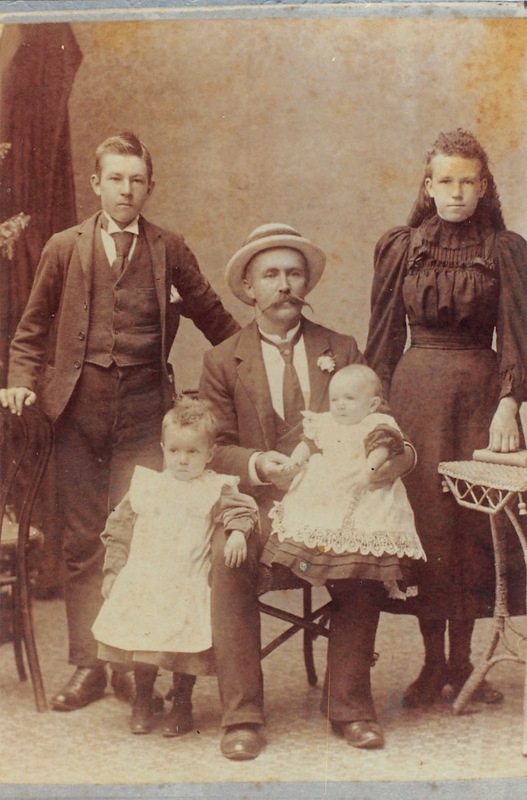 Looking at this photo again recently I assumed that the adult must be of John Young (1856-1928), posed with his two sons and his two step children, Robert Whiteman (1883-1957) and Mary Ann Whiteman (1884-1945). John’s wife Sarah Jane Young formerly Whiteman née Way (1863-1898) died at the time of Cecil’s birth. In 1899 Bob Whiteman would have been 16 and his sister Mary Ann 15. However, this interpretation is complicated by another photograph from Noel Tunks. Again the photo is noted as having been taken by Charlie Farr Maryborough (no 14556 handwritten on back). I wrote that this picture was of George Wilkins, Charlotte Young, Ethel (Grose) & son George died WA. The two young people standing appear to be the same people in the first photograph. However, the girl’s dress is different and she looks younger in the first photograph, so I don’t think the photographs were taken on the same day. The numbering sequence suggests that this might be an earlier photograph but I think the two teenagers look older. Cecil Young and his brother Jack lived at Homebush near Avoca with their aunt Charlotte Wilkins née Young (1861-1925) and her husband George Wilkins (1857-1944). Charlotte and George Wilkins had two surviving children, Ethel (1883-1955) and George (1884-1909). I think the girl in the two photographs looks older than the teenage boy and so I think it is more likely that the two teenagers in both photographs are Ethel then about 16 and George Wilkins, who would have been about 15. I don’t think the two men are the same, but I don’t know why John Young would be photographed with his niece and nephew George and Ethel Wilkins as well as his two small sons. It would be nice if there were other photographs to compare with these. Perhaps some other Young or Wilkins family descendants have some. An update – October 2016. Yesterday we visited a cousin of Greg’s on the Way side of the family from Parkes. She had a magnificent family photograph album. The first photograph was among her family photos. To my mind this indicates the two teenagers are the Whiteman children and a photo of the four children was being sent back to their Way relatives in Parkes. Although the teenagers look similar, with similar hairstyles I think they are in fact different – one is the Young and Whiteman family, the second family is the Wilkins family.